In this post we’ll look at the “share” standards developed by GS1. Specifically we’re going to look at the Global Data Synchronization Network (GSDN) and Electronic Product Code Information Services (EPCIS). EVRYTHNG enables brands to leverage these standards, realizing the vision of standards interoperability and information exchange. Let’s dive right in. 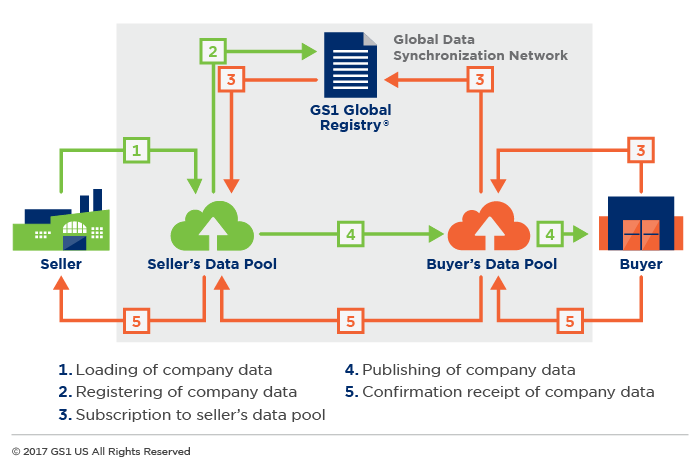 GS1’s GDSN helps brands manage and share their Master Data on a global basis. This makes it easy to publish and update data about their products. GDSN does this by using what are called Data Pools, which brands subscribe and publish information to on a regular basis. As of November 2017, the global registry has 36 Data Pools, 45.9k Trading Partner GLNs and 25.1M GTINs. That’s a lot, so it’s important to be part of it if you use GS1 identifiers! Figure 1: how GDSN works. If a brand is not a member of the network, it can be a daunting proposition to join. Which data pool do they join? How do they get started standardizing data? EVRYTHNG simplifies it all and helps the brand become GDSN-ready without having to work through each of these challenges or questions. The data structure standards are there through our implementation of the GS1 semantic model (remember blog post #3?). We’ve also standardized the communications approach to make things easy as well, using the Web of Things model. This means that a brand not already leveraging the GDSN can be up and running in no time. If a brand is an existing member however, they are not without some challenges. Connections to data pools come with management overhead and changes to Master Data sets have downstream implications that need to be considered at all turns. That’s why we put in place our flexible, standards-based data model: to help help brands manage these challenges. However, it’s worth saying that joining and leveraging the GSDN is a minor thought in comparison to handling the ever-changing demands of your data consumers. Being an open standards based network, it’s expected that the GDSN shouldn’t change as rapidly as a proprietary based system. This ensures that all systems leveraging it continue to work no matter what new platform or technology stack is introduced. However, let’s talk about what happens when the data model needs to evolve. 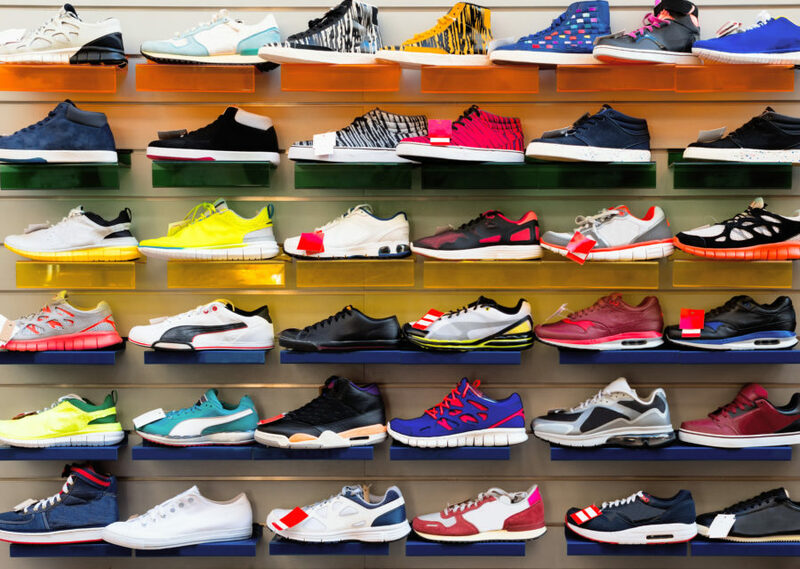 It can slow down brands from reacting to new industry needs or fast evolutionary changes. Technology will always evolve quicker than standards, so ensuring that a brand can future-proof themselves for emerging data communication strategies is vitally important. The same data model that EVRYTHNG provides helps address these challenges as well. It provides a layer of standardization and validation to help conform to standards, but in a manner flexible enough to augment the model to try new things. This allows brands to simplify their strategy for current/future e-commerce integrations, marketing channel evolutions and the emergence of new platforms with new data demands, all the while supporting a consistent and stable standard in GDSN. Ok, we’ve structured the data around a brand’s products and shared it with everybody interested; now we need to track and describe their movements. GS1 EPCIS to the rescue! 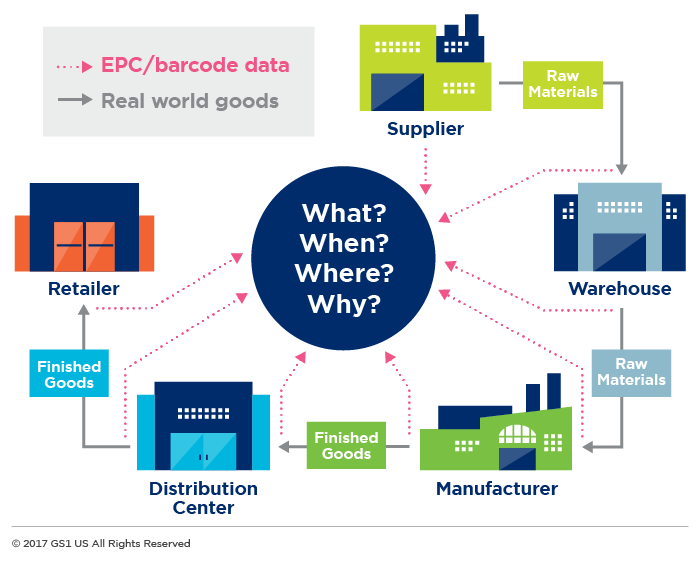 GS1 EPCIS is a structure that gives a brand the What, When, Where and Why of its products, and can be implemented with both product-level data (GTINs) or with serialized products (SGTINs). The execution of this is very straight forward on the EVRYTHNG platform. We have Places identified with GLNs, Products with GTINs, Thngs with SGTINs and Collections with SSCCs. To model their movement and the events associated with them, we simply create Actions on any of these resources. Action types are the means by which you identify the EPCIS Event Type (Object, Aggregation, Transaction, etc.). The flexible Action data model then handles the payload of that event; items such as the class or instance-level objects, the location, time and reason (Business Step) are all described in the GS1 Core Business Vocabulary (CBV). The EVRYTHNG platform also extends the model to include additional information from the web client itself. EVRYTHNG’s action model allows a business the flexibility to implement just the portions of EPCIS that add value to their organization. Finally, regardless of whether a brand fully implements EPCIS semantics and structure, chooses some portions of it or creates a new model altogether, it’s important to understand the value of the Action data model. It has been created to help model real-world events digitally, such that all physical events are recorded. These events are immutable, providing a clear chain of visibility and audit to help brands have complete visibility across their supply and distribution networks. This also means you can use technologies like blockchain to record the events in a similar register. Check out our blockchain whitepaper here for additional details. This was the last in our series on GS1 Standards – you’ve probably seen enough acronyms to last a lifetime! We hope these blogs have given you a deeper understanding of how GS1 identifiers, and the standards surrounding them, can be used and extended on EVRYTHNG. Chances are you have the identifiers today, leverage them in many different processes throughout the enterprise, but just need to liberate them to increase their interoperability. That’s what we do! Reach out to us at hello@evrythng.com, and let us help you break down your legacy data silos. And if you liked this blog series, please feel free to suggest other areas of interest you think we should explore further.